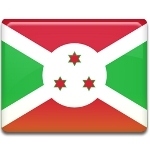 Colonization of Burundi began in the early 20th century by Germany. The territories of Burundi and Rwanda were occupied by Belgium during World War I and after the end of the war they became a Belgian League of Nations mandate territory. Belgium administered both countries as one colonial empire, known as Ruanda-Urundi. Tensions between the Hutu and the Tutsi pygmy people in Rwanda made the latter to flee to Burundi and find freedom from persecution. Both countries were involved into a civil war. Ruler of Burundi Mwami Mwambutsa IV requested separation of Burundi from Rwanda in 1959. In the same year political parties were formed, that brought attention of Europe to situation in Ruanda-Urundi. Belgium granted Burundi independence on July 1, 1962. The state wasn't any more the part of Ruanda-Urundi, that is why it changed its name to Burundi and Mwami Mwambutsa IV was proclaimed its king.